Our Home is situated in Bobo Dioulasso – near the town centre and with easy access (walkable) to several schools. We have a large outdoor private compound surrounded by a wall in which the (rented) building is situated. The building has a large communal living space for eating and socializing, an indoor bathroom, an indoor kitchen, and 3 large bedrooms. There are usually 3 to 4 children of approximately the same age sharing a bedroom. 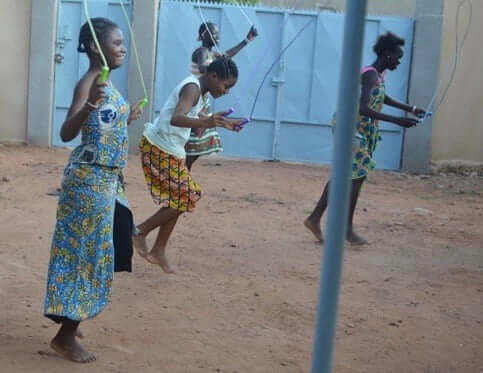 The children may come from different tribes and speak different languages but French is the common language spoken in Burkina Faso so the children are encouraged to learn and speak French both in the Home and at school (where it is mandatory). The Home is secular and does not orient the children towards any particular religious belief. We do, however, respect particular beliefs of the children and/or their families and we will facilitate their participation in activities organized by different religious communities – so long as these activities do not conflict with the formal education of the child or negatively impact her/his physical and/or emotional development. The Manager / Directrice (Gwladys Bassole) – who has been looking after the Home and its occupants since prior to 2005. The Cook (Bibata) – whose primary responsibility is buying the food & preparing the meals. She spends approximately 8 hours in the Home each day and is very connected to the children living there. She cares for the younger children after school and teaches the older ones how to prepare the meals. Bibata has been employed by Souman Nafaman since about 2005. A Caregiver – who comes every day for 4 hours (5pm -9pm) to help the younger children with homework and their evening routines. The Night Watchman – who is responsible for the security of the building throughout the night. Tutors – who are engaged by Gwladys as required to provide specific assistance (usually in math) to children that require it.